Hospital trusts and clinical commissioning groups have opportunities to improve cancer patients experience of care by looking at the variation highlighted by a national survey published by NHS England. 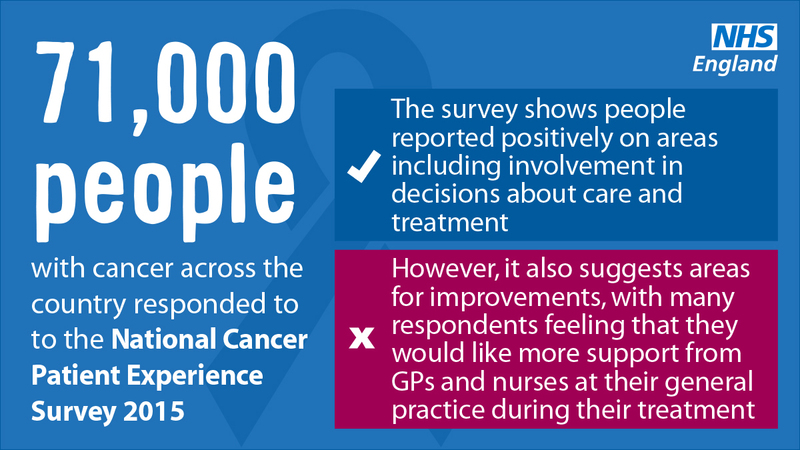 Local level data from the National Cancer Patient Experience Survey 2015, will be used as a key tool to ensure better care for people with cancer, providing a baseline to work from. 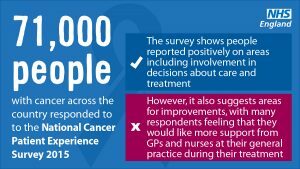 The annual survey of how cancer patients are cared for in the NHS has undergone an extensive review to ensure it is a better tool to help deliver the national cancer strategy, and follows consultation involving patients, clinicians and other stakeholders to ensure it best represents patient experience. Nationally, the survey shows people reported positively on areas including involvement in decisions about their care and treatment, and feeling they were being treated with dignity and respect. However, it suggests clear areas for improvement, with many people responding that they would like more support from GPs and nurses at their practice during their cancer treatment; and many feeling they weren’t given enough care and support from their local health or social services. The survey also highlighted a lot of variation between both clinical commissioning groups and hospital trusts in the experience people had across a range of areas. The latest local and national survey data will be included in the new Cancer Dashboard, published earlier this year, which brings together key cancer data in one place. The Dashboard is intended to help Cancer Alliances, which will be made up of local clinical leaders, commissioners and providers, to quickly and easily identify priority areas for improvement, putting patient experience alongside other key measures such as survival and access to treatment. The Dashboard was launched in May to coincide with the publication of the wide ranging plan from the National Cancer Transformation Board, led by National Cancer Director Cally Palmer, which will lead the implementation of the recommendations of the report from the Independent Cancer Taskforce. “Although overall the experience of people with cancer is relatively good, we know there is much more we can do to tackle variation across the country and between different population groups. “A key ambition of the Cancer Taskforce was to put patient experience on an equal footing with other outcomes. To support improvements, the NHS has brought together all the data available, including data on people’s experiences, in one place to create a new integrated ‘dashboard’ for cancer. The annual survey of how cancer patients are cared for in the NHS across England has undergone an extensive review to ensure it is a stronger tool to help deliver the ambitious national cancer strategy. Patient experience, along with other key cancer outcomes, will be included in the CCG Improvement and Assessment Framework, which will be published for the first time this year. The integrated Cancer Dashboard is available via cancerdata.nhs.uk. The current Dashboard represents phase 1 of this work. Future phases will have additional functionality and data for indicators that are currently under development. There have been a number of significant changes to the 2015/16 survey including the structure and content of the questionnaire and how it was administered. This means that even if the question remains the same, it is not possible to draw a direct comparison between these findings and those of previous years. 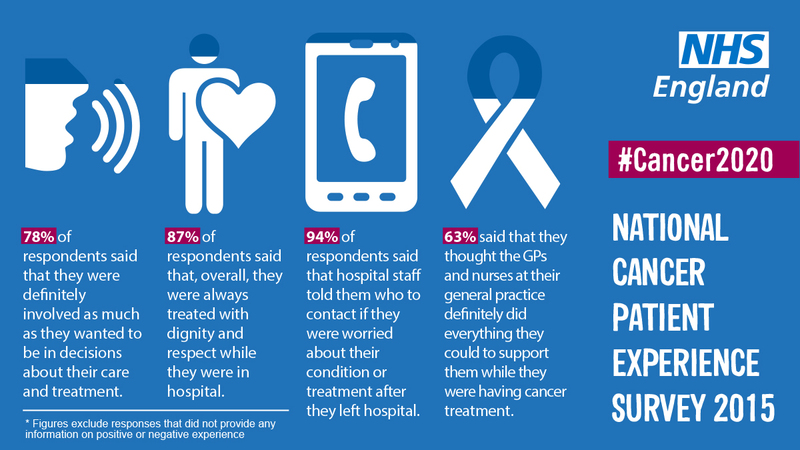 The Cancer Patient Experience Survey (CPES) has been carried out annually since 2010. Ahead of the 2015 survey, NHS England, the Cancer Patient Experience Advisory Group, patient groups and other key stakeholders indicated that updates may need to be made to the survey to take into account changes in patterns of service use, policy and the regulatory landscape. In order to understand what changes needed, an engagement exercise was carried out with patients, commissioners, providers, charities and other key stakeholders. Details of the findings from this will be made available along with the results. The length of the questionnaire has been reduced. This change was in response to clear feedback that the survey was too long and that some of the questions were no longer relevant. Response options have been reviewed and changed to make them consistent throughout the survey to try and avoid confusion for respondents. Some of the questions and/or answer options have been changed so that they are now in line with questions in other surveys (e.g. the Care Quality Commission national patient surveys), so that comparisons can be drawn between them. The topic areas within the questionnaire have been redesigned to capture the whole patient journey. Changes to the survey topic areas have been made to ensure that experiences are captured across the whole patient journey and not according to service boundaries. An online version of the questionnaire has been developed to make the questionnaire more accessible for respondents. The 2015 survey sampling and fieldwork periods has changed. 78% of respondents said that they were definitely involved as much as they wanted to be in decisions about their care and treatment. 90% of respondents said that they were given the name of a Clinical Nurse Specialist who would support them through their treatment; and when asked how easy or difficult it had been to contact their Clinical Nurse Specialist, 87% of respondents said that it had been ‘quite easy’ or ‘very easy’. 87% of respondents said that, overall, they were always treated with dignity and respect while they were in hospital. 94% of respondents said that hospital staff told them who to contact if they were worried about their condition or treatment after they left hospital. 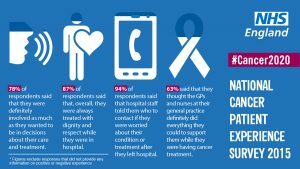 63% of respondents said that they thought the GPs and nurses at their general practice definitely did everything they could to support them while they were having cancer treatment.